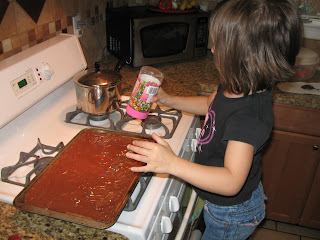 We tried out our oven a couple days ago, made some toffee bars with rainbow sprinkles on top. Our oven has a light in it, which we didn't have at our old house, so it's quite fun to watch things bake. Raquel helped out a lot with this recipe. 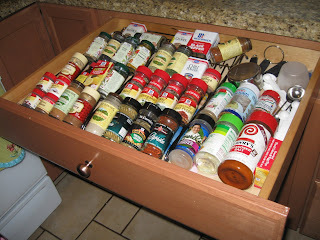 And this is my spice drawer in which I have placed a couple of those in-drawer spice racks. They don't fit perfectly but well enough. 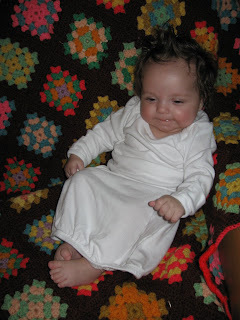 Here is Maxine in her nightgown on top of a throw my great-grandma Lena Looney made a long time ago. Grandma Emma gave it to me. 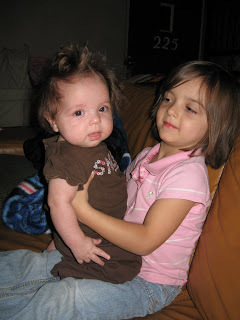 Raquel has gotten really good at holding Maxine now that she's a sturdier baby. How cute. Yummy! 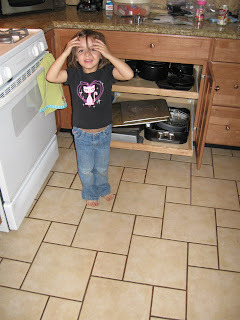 How fun to try the new oven. I like how you organized the recipe drawer. I love those throws! Wow your grandma Lena Looney made it? It's beautiful! What did you girls make? Iris: we made toffe bars covered in melted milk and dark chocolate and rainbow sprinkles :) Yeah, they're gonna love that picture for the rest of their lives, I think. And Lena Looney is my Grandma Emma's mother, so my Great-grandmother! HL: thanks. I am LOVING this countertop. It's the nicest one I've ever had. Ad clicky clicky what? I clicked on some of your ads.